Drawing on George’s two decades of private practice work. Now comes a new unique process you can purchase, own and use in the comfort of your own home. Using some of the most advanced know-how in human development and healing, drawn from the experience of thousands of actual client sessions. 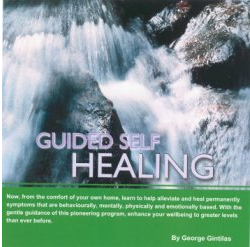 George has created a program you can use over and over again to help you heal things that would normally require you to see a therapist. The program draws on some of the latest findings on the mind-body connection and what constitutes true permanent healing and is one of the products of over eighteen years of ongoing research and private practice work. More information & testimonials. If you are purchasing the Digital Download version please ensure that you have a strong and fast internet connection. Click here to download your Booklet Guide. Clients had been asking for it for years. This CD is based on work with a sample of approximately 600 clients seen one-on-one over a four year period. All 600 went through a relaxation process at the beginning of their sessions (for P.S.H. Therapy). The relaxation process was so effective that many requested a copy to take away with them. Time and again I would witness people who beforehand had truly believed they could never be relaxed – look stunned after the process, as they felt just how relaxed they had allowed themselves to become. These were often people that had tried everything and were convinced they could not relax. As well as the relaxation process – the CD provides detailed instructions for your conscious intellect. Answering all the questions that the intellect normally needs to hear in order for it to let go and let your body relax the way you were born to do – naturally. 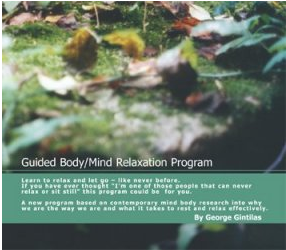 The program was also designed to allow you to eventually be able to relax without the need for the CD. 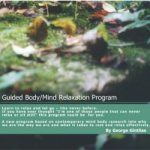 The program draws on some of the latest findings on the mind-body connection and what constitutes true healing and rest, and is one of the products of over thirteen years of ongoing research and private practice work. Once you have mastered this level of relaxation you can progress to Level 2 (below). An interview on National Television in Australia on a Health and Wellbeing Program, talking about this Relaxation CD. Plus $3 per unit postage. Level 1 relaxation (above) is great to begin with if you have a racing mind, an intellect that over thinks and find it hard to stop and just be. Level 1 is designed for such people. High achievers and high thinkers. Once you have the ability to switch off to a degree, then you may be ready for Level 2 relaxation. This is a chance to go deeper still. This level 2 program is designed to follow on from Level 1. So I recommend starting with the Level 1 program then advancing to this program when you have mastered the alpha level of relaxation first. When you are ready for it, this program is ready to take you there. More depth, more peace, more healing and healthy rest for the cells of your body. They will thank you for it! Plus $5.00 per unit postage. A BEST SELLER with over 11,000 copies sold in Australia. The first book on P.S.H. Therapy. Written by the originator – Frank Wright. Released in 1995 and now in it’s second printing. 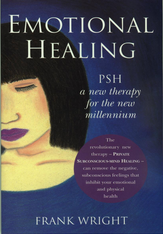 Emotional Healing documents hundreds of case studies of actual clients who undertook the three to four sessions in P.S.H. Therapy. The first few chapters cover the basic principles highlighting the privacy factor and the need to NOT know or dig up why a problem exists. And how this helps the healing process faster when clearing the original feeling cause of symptoms. 262 pages. In Australia – check out your local library. Many have a copy you can borrow. A 43 page booklet on the Radix method of Body-Centred Psychotherapy. Written by Narelle McKenzie and Jacqui Showell. Includes examples from actual client cases. A very easy to read booklet that summarises the essence of Radix. Both Narelle and Jacqui are Radix trainers in Adelaide Australia. They completed their training in 1982 in the USA and began training people in Australia in the early 90’s.